Cars Brought to a Halt! Cat Crossing, NYC. At one point though, driving a car in Manhattan not only made sense; it meant “freedom,” that tried and true American ideal. In Winifred Van Duzer’s excellent 1926 novel, The Good Bad Girl, 19-year old Mimsi comes to New York City from the small town of Tranquility. She wants to be an artist, but winds up subject to the great city’s ebbs and flows of fortune, heartbreak, and danger. (A couple of cads haunt the narrative, making Mimsi miserable). Careful, Mimsi! You Know Artists are Dangerous Characters! At one point, Mimsi is taken under the wing of a wealthy man who offers her sole use of his Washington Square home (yes, home) and his “roadster,” which is conveniently stored in a nearby garage just around the corner. 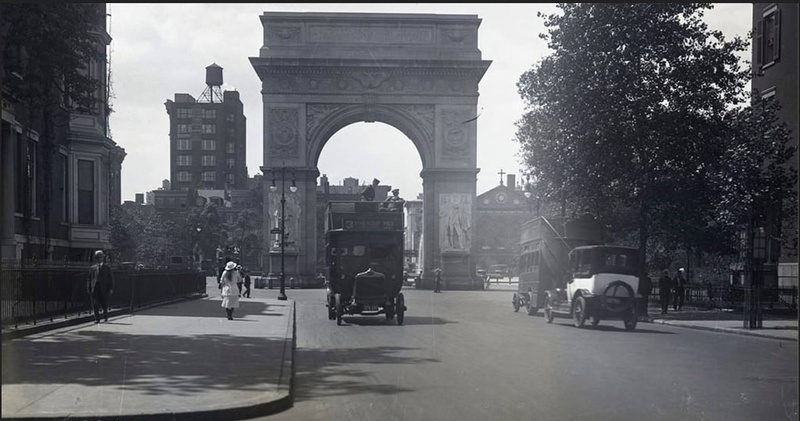 Mimsi’s Haunts: View of Washington Square arch, 1920. All alone in the city, save for her white collie, Luck, a depressed Mimsi takes to sleeping during the day and driving through the city at night. She retrieves the great roadster from the garage and drives north through Manhattan at nightime. Here, she finds herself again. Mimsi, is that you? And your 1926 roadster? Driving all night, Mimsi re-discovers her strength. She drives around the city and beyond its limits, night after night, racing along country roads and through towns that sleep in the darkness. “On and on, sweeping through other little towns, along Main streets where drug-store windows blazed red and blue all night and the white steeples of white churches threw long shadows. Mimsi finds freedom behind the wheel. She finally “conquers” the city by getting into the roadster and driving. 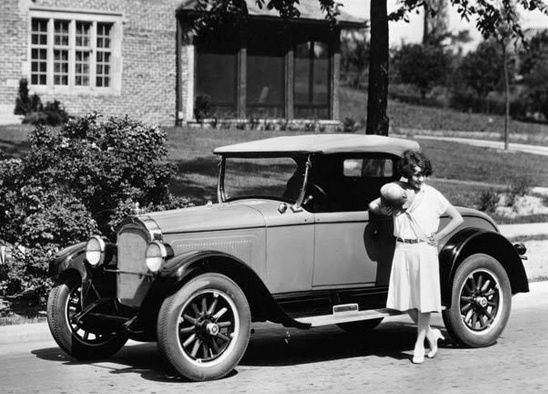 This is just one aspect of Van Duzer’s novel that provides a glimpse into popular attitudes concerning cars in the 1920s, and the ease of their use in Manhattan! NYC, 1934. 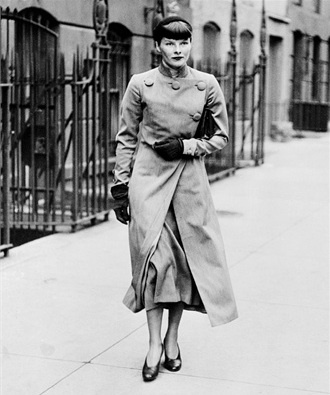 Hepburn on Foot, by choice. She could drive (and park) anywhere! 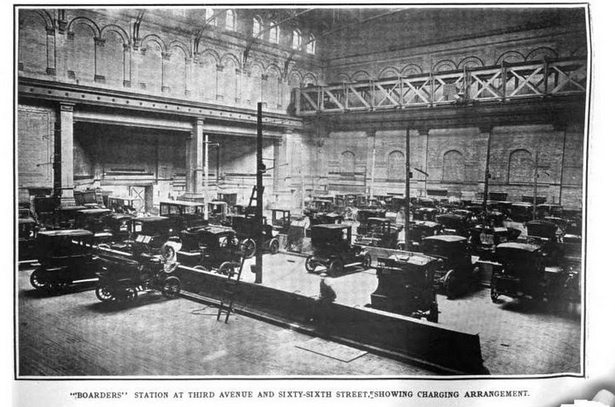 New Yorkers were early adopters of the auto. 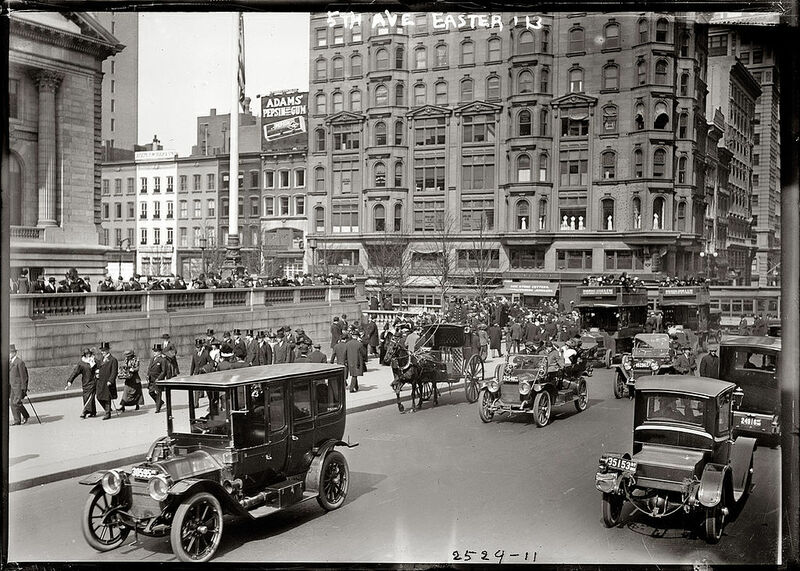 In 1900, there were an estimated 8,000 cars in the entire U.S, and nearly a third of those were owned by New Yorkers. Early Adopters in the Easter Parade, NYC. Autos on Display. Side Street: Hey, look! There’s a space! 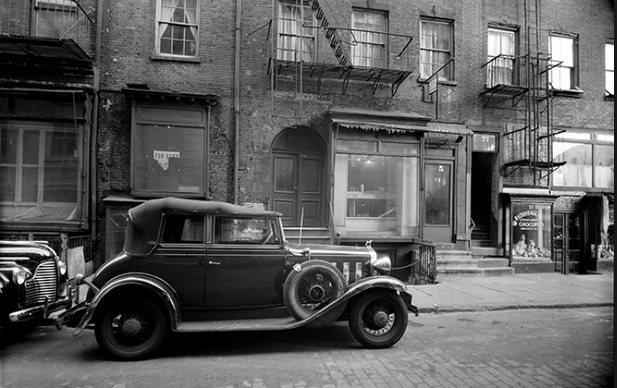 1920s parking in NYC. Those who did not own their own cars could still enjoy traveling through the city by car. 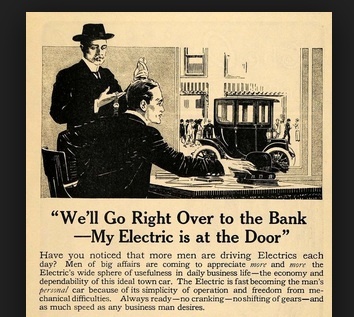 Hailing hired cars (electric), which were charged at facilities around the city, was commonplace. Henry W. Perry, “Automobiles for Everyone in New York,” Automotive Industries, June 7, 1906. Map of charging stations for electric cars, NYC, 1923. As the city’s population opted more and more for the personal freedom of owning a car, the ease of driving in Manhattan came under threat. 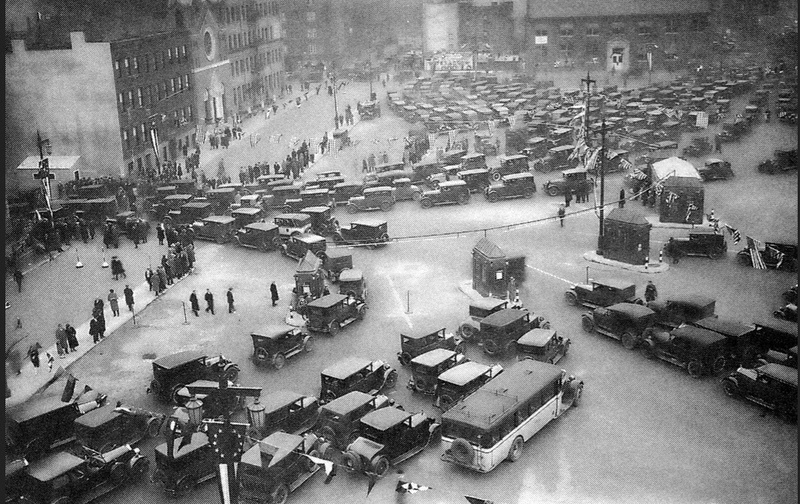 And by the late 1920s, as more and more cars appeared on the city’s streets, residents became concerned with a new, modern problem: traffic. Construction was soon underway to try to address the problem. Holland Tunnel Opening Day, 1927. Soon even automobiles had places to rest in the city when not in use. The “hotel for auto” (also called an “Auto Inn”) made its appearance. You can read more about those here. Fantastic post! It’s been years since I last read The Good Bad Girl, but this took me right back. Thank you so much! I was so excited to come across your wonderful blog! Thank you for the terrific post about The Good Bad Girl. I was surprised to see how little info there was about Winifred Van Duzer out there. She definitely needs her own wikipedia page! I just love these novels–some of my favorite authors are Kathleen Norris, Beatrice Burton, Faith Baldwin, and Ruby Ayres. They definitely knew how to tell a good story and I love glimpsing the past via these books. So nice to connect with you!